Nokia revealed Nokia N8, forthcoming flagship product based on the Symbian ^ 3 OS. 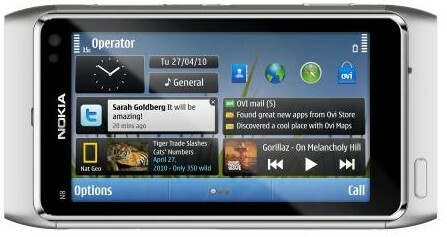 The Nokia N8 is the first smartphone to include the latest touch OS from Symbian foundation, and it uses a customized Nokia UI. Nokia demonstrated Nokia N8 when they disclosed the preview of Symbian ^ 3 OS, last year. The remarkable feature among the specifications of Nokia N8 is the availability of a 12MP camera with Xenon flash and HD video recording at 720p. Nokia N8 also includes for TV out and an HDMI port for the first time in a GSM phone. The greatest attraction of Nokia N8 is its price. Nokia N8 costs far less than 12 MP phones like Samsung Pixon 12, Sony Ericsson Satio, and most other mobile phones including the Nokia N97. Nokia N8 is the second Nokia phone with capacitive touch screen. The 3.5 inch AMOLED display of Nokia N8 has 360 x 640 pixels (nHD) resolution and 16 million color depth. This screen supports multi-touch gestures, pinch-to-zoom and accelerometer for auto rotation of UI. The improved graphics performance and multi tasking promised in Symbian ^ 3 OS would enable users to watch high quality videos and play 3D games at maximum speeds. Redesigned image and video galleries provide assistance for better movement through media, and the capacitive touch makes the scrolling, faster and smoother. The Nokia UI for Symbian ^ 3 OS is appealing and easy to operate. Therefore, N8 will include support for 3 home screens, which are further customizable with widgets, applications and apps. There is visual task switcher, that let users to flip through all open applications and close them if needed. The Nokia N8 is manufactured with native applications for accessing instant messaging, social networking, email, TV, Youtube and other services. Hundred of applications will be available for download at Nokia Ovi store. Nokia N8 is the first phone to support cross-platform Qt web apps. This would enable the deployment of Windows, Linux, Mac OS, Windows mobile, S60, MeeGO and Maemo applications in Nokia N8, if they are developed on Qt framework. The 12 MP camera in Nokia N8 comes with Carl Zeiss optics, Xenon flash and HD video recording. The HDMI port in Nokia N8 can be used to output the videos to external HD device with Dolby Digital Audio quality. The device includes 16GB inbuilt storage along with 256MB RAM and 512 MB ROM. The storage can be expanded to 32GB using Micro SD card. Nokia N8 is a 3 band GSM and 5 band 3G phone that will support all most all telecom networks in the world. Other notable features of Nokia N8 includes TV out, FM transmitter, FM radio with RDS, A-GPS with life time navigation using OVI maps, voice command, 3.5 mm headphone jack, Bluetooth with A2DP, MicroUSB port, full web browser, EDGE, GPRS, WLAN, digital compass, document reader, MP3 player and Flash Lite 4 support. 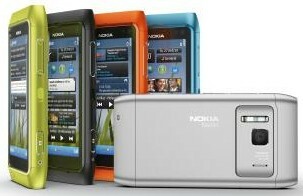 Nokia N8 is made with anodized aluminum enclosure of 5 different colors, Dark Grey, Silver White, Green, Blue and Orange. Two things we felt bad in Nokia N8 spec sheet are the processor and battery. ARM 11 680 MHz processor with 3D hardware acceleration is good, but not up to date when compared with latest processors like Snapdragon. The 1200 mAh Nokia battery should be been replaced with 1500 mAh used in N97. However, it seems the Nokia is more conscious about the price of Nokia N8 when it reaches customers. In that sense, they managed to produce the best phone in its class. Nokia will launch Nokia N8 in the third quarter of 2010 in Europe and Asian countries. The expected market price of Nokia N8 in USA is 500 USD. Launch date of Nokia N8 in India would around the Diwali season, and it will cost 22000 INR before taxes. Nokia n8 is not nokias flagship product.. Nokia has never confirmed it.. Dont assume stuff..
And for the love of god.. its not flash lite 3 support.. its flash lite 4… all these details have been around for a very long time.. bad site.. u shudnt mislead ppl..
1. Very good in video recording. but guys same old n common problem of nokia is c: drive memory which creates problem in slow down processing after installing few top software’s in it…all phone r best including this also but , one n only major draw bac is c: drive memory will be not enough for this type of high quality phones . One of the Indian website is taking Orders for Nokia N8. I booked N8. Have recently spoken with Nokia India and they have categorically stated that the N8 will not be available in India until Diwali (if that). Also the estimated price on various blogs are way off the mark and pure speculation. The handset in the US alone is $549 (Rs. 26,352). Now add a 7% Sales tax (Rs. 1845) and an approx. $70 (Rs. 3,360) Intl Shipping charge and it amounts to roughly around Rs. 32,000/- The Nokia N8 is in direct competition with the iPhone 4, so don’t expect it to come cheap. I liked this phone when will it arive in mumbai………. HTC pure is a nice smart phone from HTC. I like up this phone as the look of the handset is very impressive and one could easily get attracted towards it. The handset is not enabled with the headset but inspite of this the set is featured with other latest technologies which enhance the feature of this set. Anjanu Sonkar – where did u hear this. and is this news for Mumbai as well.. ? If you can let me know where this is possible in Mumbai it will be a great help thanks..
People will take a little longer to adjust to Symbian 3 Os. Rest all is good but due to a few drawbacks, the price tag seems a little high though the phone is awesome. nokia is a local company in this world , their products are local quality and older technologies. please use sony ericsson products. You seem to be one of the marketing guys of Sony Ericsson (SE) outlets. SE is still faaar away from Nokia regarding mobile technology at least. Recently I bought one of the so called SE’s high end models the “Satio”. And that’s a worthless to the power infinity gadget. Its 12.1 Megapixel camera is good for nothing, and the symbian OS is a junk loaded within a buggy gadget. I just somehow managed to return that costly “good for nothing”. So, better not to even utter the word Sony Ericsson here. Nokia simply rules. Long live Nokia. the price of n8 has been shown different different on net.wat is the actual price of n8? main v ah phone leya se. par eh phone ena v vadeya ne.bus screen touch he hai. esde khube.hoor kush v ne.main ta pasta reha eh phone le k.vadu de passe kharch kar le.aadu changa nokia x6 hai.nahe patla te halka.teh function v oche bohot ne.bus ahe mere tuhanu advise hai.